How could I put a tipi-like structure up in the air? I began to make some models and do some rough drawings. I was influenced by Bucky Fuller who said that structures should have an integrity that didn’t depend on gravity. 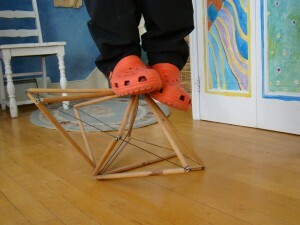 I think he called that “tensegrity”. If the house I live in now, a Greek Revival built in the 1860’s, were pushed off into space, the components would begin to come apart. 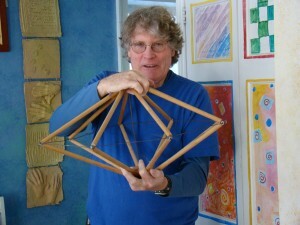 A tensegrity structure would hold together, like a bicycle wheel. It wouldn’t depend on the forces of gravity. Long ago I built an eight-sided model out of dowels, eye screws and wire. I was impressed with how stiff the structure was and how strong it it felt. I carried that model through all my life changes and moves. I hung it up in a prominent place in my office or living space so I wouldn’t forget the concept. The strength in the structure comes from the compression ring around the outside diameter – much like a yurt. I added the tension wire in the middle, but was sure that I wanted a design that would be completely open inside. I would need to create another way of tensioning the yurt. Today, I went ahead and strength-tested the structure to see if it was really as strong as i imagined. Amazingly, it held my weight (200 lbs.). In the current prototype of the Sky Yurt the downward tension comes from fabric cover. This entry was posted in Design, Uncategorized and tagged Bucky Fuller, tensegrity on January 26, 2013 by macinessex.